Botaniwifi is botanicalls but then using wifi. You have probably seen the botanicalls concept. This is where a plant communicates its water needs via twitter. You can get this in kit form for instance from sparkfun. The homepage for this is here. There are a few variants around depending on what type of ethernet interface is used and there is even a solar powered variant. The old versions use the Xport module for which you can get a breakout adapter but the old design of the PCB caters for this. The new one uses the WIZ811MJ which is based on the W5100 chip.Of course you need to use the appropriate software. The new version is now at revison 3.01 and can be found http://code.google.com/p/botanicalls/downloads/list The old one you can download a copy from here. 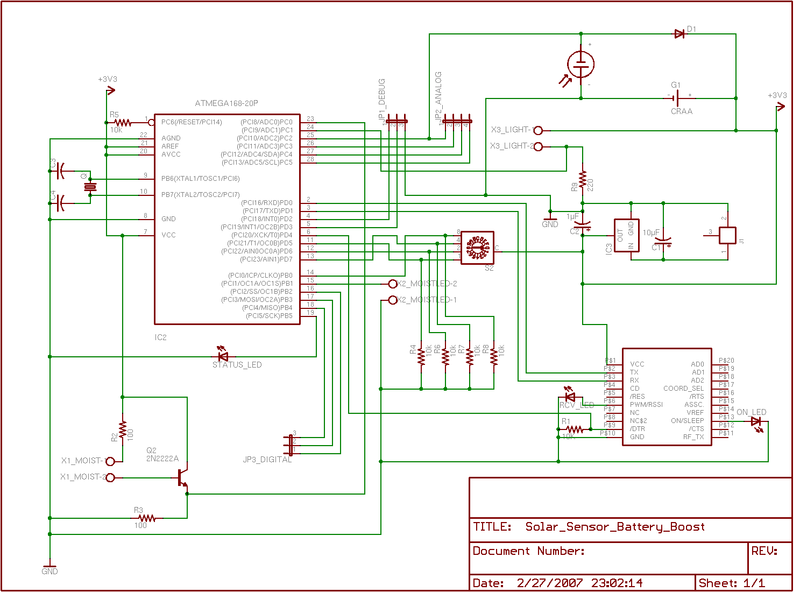 The basic circuit is rather simple so its possible to test this part easily. You can find the transistor datasheet here. I made a simple arduino shield to be able to test this circuit. This you can see on the right. 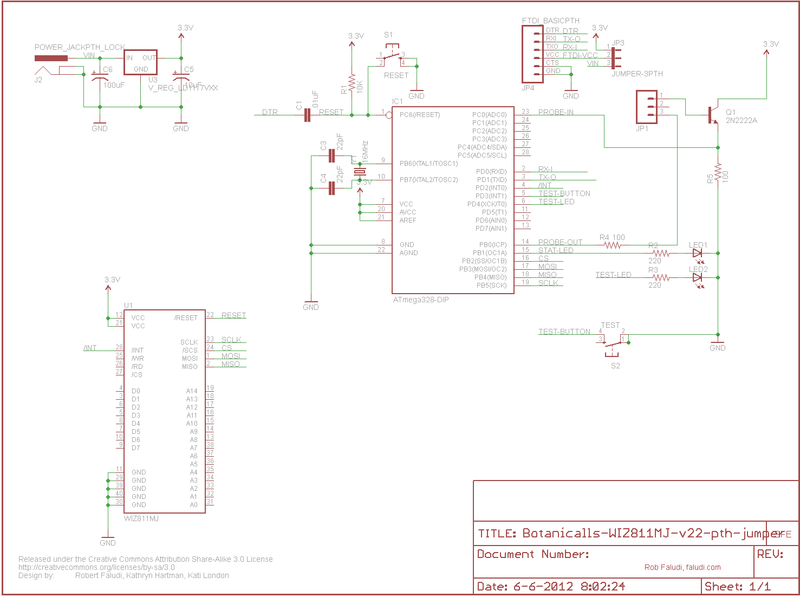 Using the AnalogReadSerial sketch which comes with arduino IDE 1.0 you can see the value of the sensor. Below you can see the nails untouched o output or touched by hand = nonzero. This indicates that the sensor is working. I certainly do not have a spare ethernet socket everywhere i have a plant and so it is rather impossible to have this installed across the house. One way would be to adapt the circuit with a Asyncslab WiFi module. This certainly would remove the need for an ethernet connection everywhere but of course this is rather expensive. The cheapest ethernet access i found was using the nuelectronics ethernet shield which comes in for the princely sum of 12.50 Euro. 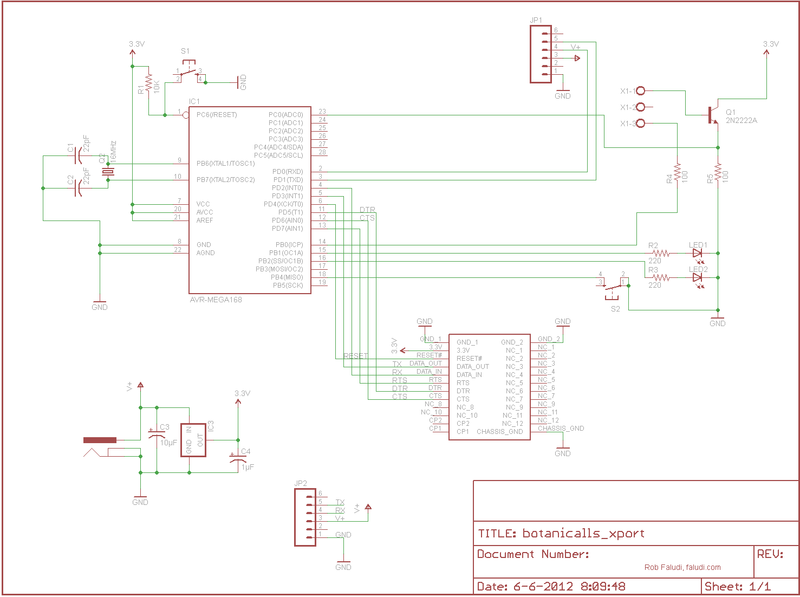 Of course you then still need an arduino and the above circuit. All in all maybe 40 Euro. This is better than the 99US$ Sparkfun wants but then it does not look as nice. All prices excluding shipping. 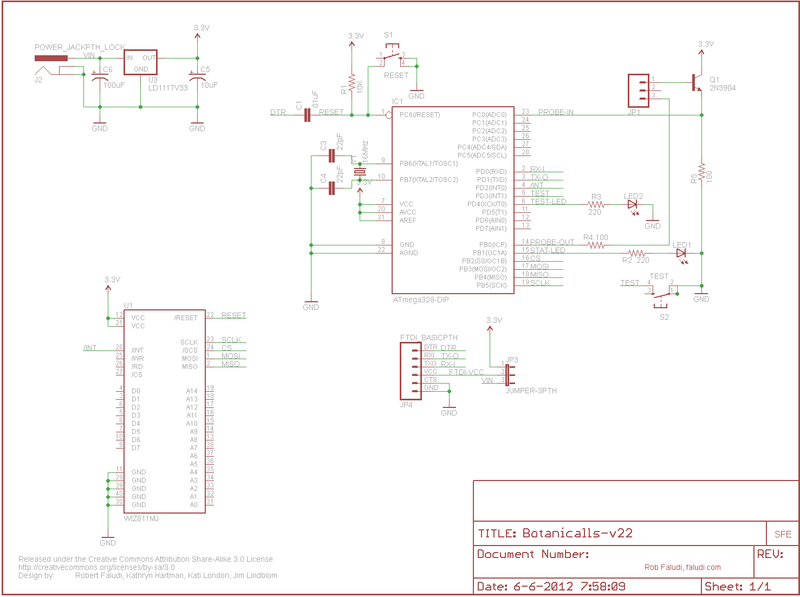 Because people have many plants and in both existing solutions from Botanicalls an expensive ethernet adapter has to be used i think it would be better to have a very simple cicuit at every plant and a base station that actually connects to the internet. Maybe bluetooth or a 433MHz hope transmitter would be better suited for this. It’s another of the ideas that i would like to develop in the future. Basically you need a jeelab node with the above interface added.